Are you looking for great ideas for your classroom this month? Why not try one of our great bundles or activities. We've been hard at work developing worksheets, printables and activities for ELA and ESL for ALL LEVELS! First, be sure to download our Christmas Freebie which is entitled: Dwarf, Reindeer or Other? This is a great activity to do at the end of the period, in the last 30 minutes. Have students look at the list of names, then try to determine which ones belong in each category. This activity can be to develop conversation strategies, but it is really intended just for fun. Our next resource is for the elementary level, particularly grades 2 to 4 ELA; or, grades 4 to 7 ESL. This booklet is full of fun and educational activities that your students are guaranteed to enjoy! The first few pages have students working with elves. Each student will discover their true elf identity and be given an elf name after completing the first two pages. Then, students will practice writing simple sentences to prepare their Christmas list. They read and interpret short texts to determine who has been naughty or nice. In other activities, kids will gain some important Christmas vocabulary which will allow them to better understand the non-fiction texts that were written just for them. In the end of this fabulous booklet of activities, there is a game which will keep your students smiling till Chrismtas. 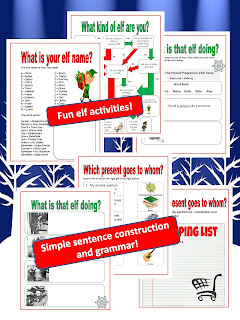 Cool elf activities that your students will love. They will discover their elf name and elf personality! After, they will describe what they elf is doing using the present progressive tense. Later, they'll make a shopping list for Christmas using the future verb tense. 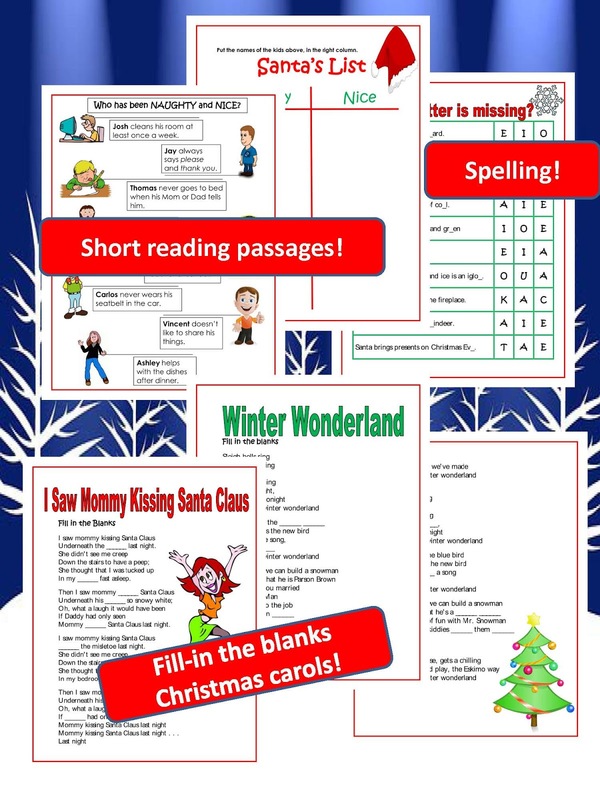 Your students will help Santa complete the Naughty or Nice list by reading the descriptions of different kids. There's also a spelling activity. Finally, how about a sing-a-long fill-in the blanks activity? Santa has a Facebook page? Of course he does! Doesn't everyone? Help Santa complete his profile. 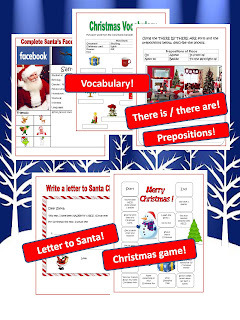 Then use the acquired Christmas vocabulary to describe the decorations in the different pictures. Use prepositions of place as well! Also, you have to write your letter to Santa Claus and play the Christmas game. Of course, we can't forget to practice that reading with a few fun reading comprehension check-ups! The final Christmas bundle was created for Middle and High School students. Once again, Middle School ELA, and High School ESL. 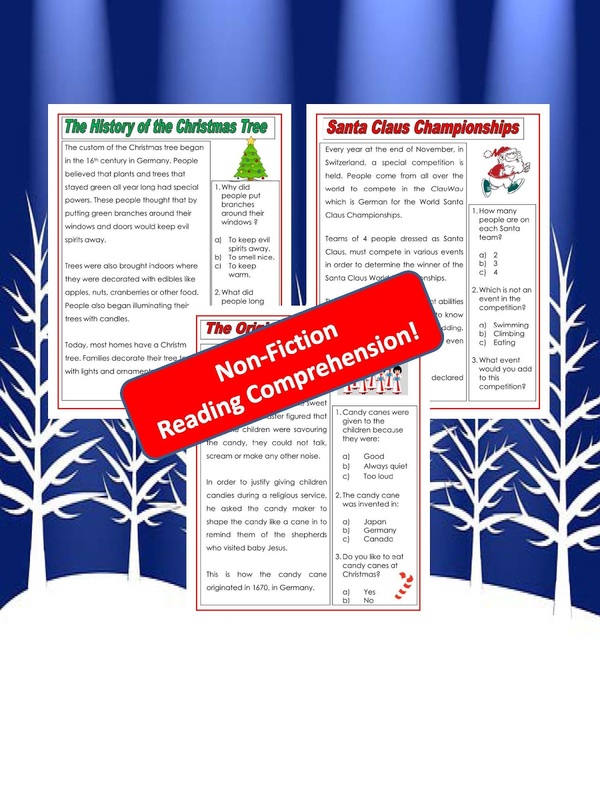 A great selection of Christmas theme short stories, poems, informative and other text types, all bundled into this great unit! The texts chosen appeal to all students, even the boys... At Creative Couple, we strive to get those boys interested in reading. Activities range from simple reading comprehension exercises, to letter writing, to comparing and contrasting, to pastiche writing (this is when you imitate the style of a particular piece of writing), to fun and games. One of my favourite Christmas activities is also included in this bundle: The Persuasive Letter to Santa Claus. I really put on a show with this last activity. I usually come to class looking pretty ticked off. I slam a brown envelope on my desk and I start asking the students questions like: What did you guys do now? Do you have anything to tell me? Who is responsible for this? The students get really uneasy... it's so funny (for me!). I then explain that I received an envelope from the North Pole and that it just can't be good news. When I pull out the letters from Santa, and start distributing them, I shake my head at each student and give them a look of disgust. This is when they also start to laugh. As we read the assignment together, the students begin to get involved. I explain the procedure of how to write a persuasive text and then let them plead their case to Mr. Claus. You'll be surprised by the different approaches some students will take to defend their case. Some students get really creative! Reading comprehension questions of varying levels to answer after reading classic Christmas stories by O. Henry: The Gift of Magi, and by Hans Christian Anderson: The Little Match Girl. Be sure to have students read O. Henry's interesting biography! Students will begin by reading a letter from Santa Claus by Mark Twain. Students will then read actual letters to Santa Claus from young children. 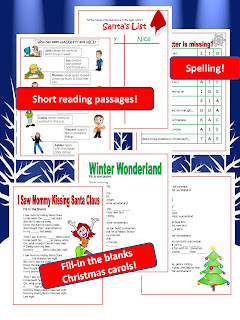 Finally, your students will write a response to each child for Santa... because he's really busy at this time of year! Poetry is sometimes intimidating, but not these poems. Twas the night before Christmas... What a great poem! Your students will then be asked to immitate the poem's style by writing their own Twas the night before ??? Also, I threw in the original version of Rudolph the Red Nosed Reindeer and the Christmas carol of the same name. How are they both similar? How are they different? You'd be surprised! As I said above, this is another great part of this bundle! I love the reaction of teens when I tell them that I got a letter form Santa saying that they are on the naughty list. Check out the RED ALERT sing on that sheet! Each student receive one of those sheets taken from the brown envelope that I slam on my desk at the beginning of the period. I always address it to myself and put the return address of the North Pole and of course the famous postal code: HOH OHO! Christmas means fairy tales and elves so I included this very famous tale. Students will learn what the elements of a fairy tale are, and what distinguishes its style from a short story. They will also read non-fiction texts about one famous adventurer, Fred Dion, and another group of fearless sailors. And lastly, I included a few great discussion activities and games. What would you get the following people for Christmas is always funny. Students love to be creative and think up silly things. The You Be The Judge activity is also a great conversation starter where students must decide whether the people acted appropriately or not, in the situations described. Of course, I added some jokes (associate the joke to the punchline), a maze (help Santa deliver the presents), and a crossword puzzle.